Successfully Added Roof Mount Car DVD Player with 10.4 Inch LCD Screen to your Shopping Cart. This roof mounted vehicle audio and visual entertainment system features a 10.4 inch TFT LCD display with amazing 800x600 pixel resolution for vibrant color and crystal clear picture quality. This high brightness LCD screen can be rotated 90 degrees to the left or right, so it is in the perfectly position for everyone in the car to enjoy a good time. This cool gadget is perfect for keeping your passengers entertained. The high quality, region free DVD player that can playback DVD's you bought from anywhere, Europe, China, Latin America, etc. If you do not have any DVDs with you, no problem! 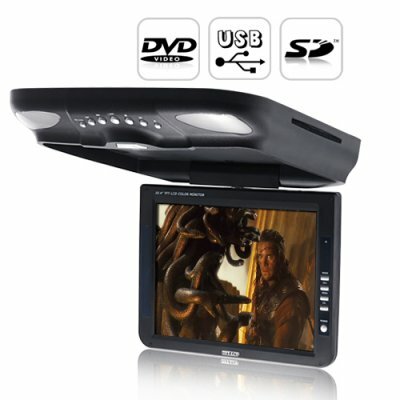 The Roof Mounted Car DVD player features a SD card slot and an USB/mini USB connector that you can use to share your favorite multimedia content/Video Clip/Movie Files with everyone else inside the car. Additional features for this roof mounted car DVD player includes AV input for gaming consoles and other video output gadgets, an analog TV that can work with PAL/NTSC/SECAM system, a full featured remote controller and AV output for audio system and possibly a secondary display device. A great wholesale price makes this Roof Mounted Car DVD Player perfect for the re-sale market, OEM market, or company/personal use. As always, it carries our 12 month Satisfaction guarantee and is only available directly to you from the best China electronics wholesaler - Chinavasion. What is the AV output connectors for? The AV output connectors can be connected to your audio speaker system or another display device. Does this Roof Mount Car DVD Player comes with Digital TV system? No, unfortunately it only comes with analog TV system. But if you enjoy the high definition, lively colored digital TV, then please check our Car DTV Receiver C44, C45 or C46 that can output DTV signal to the 10.4 Inch LCD Screen of this Roof Mount Car DVD Player.